Every year no matter how much time I put into preparing for Advent (the time of preparing ourselves for Christ's birth at Christmas!) I always feel like there's more that I wanted to get done. 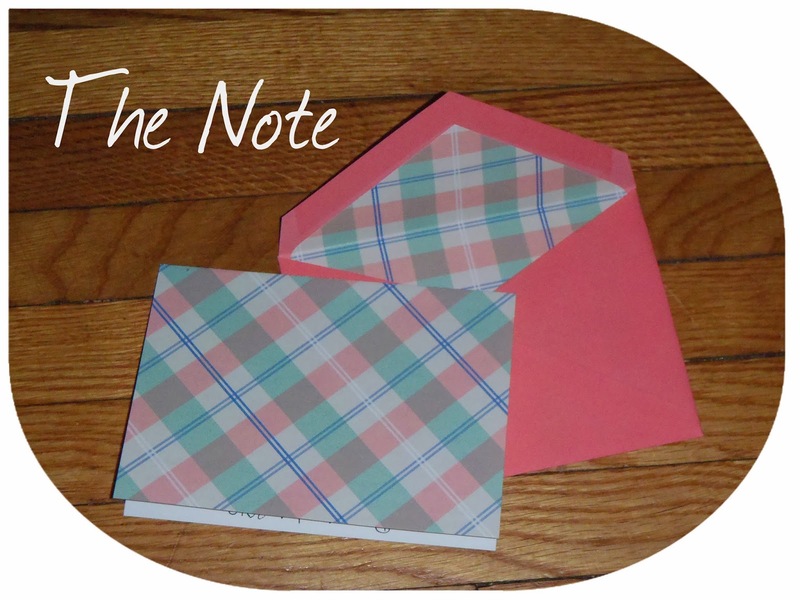 There are just so many cute ideas out there for kids that I can see my kids enjoying. I know that in the end I'll have finished the ones that mattered to me the most and I'll let go of the idea of the others for another year. It's not a bad sort of stress, it's actually the kind that pushes me to get more done and since I enjoy crafting it's actually a lot of fun seeing how things turn out (even if I do end up longing for a few more days between Thanksgiving and Advent's first Sunday). Once the altar was done I turned to my other plans for the night. 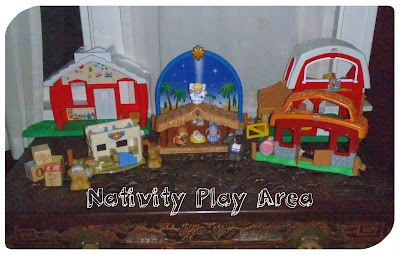 I used some of our toys to set up a little nativity village in the play area that the kids can play with. Then I set up a second nativity play area on one end of the altar. This nativity only contains animals at this point. 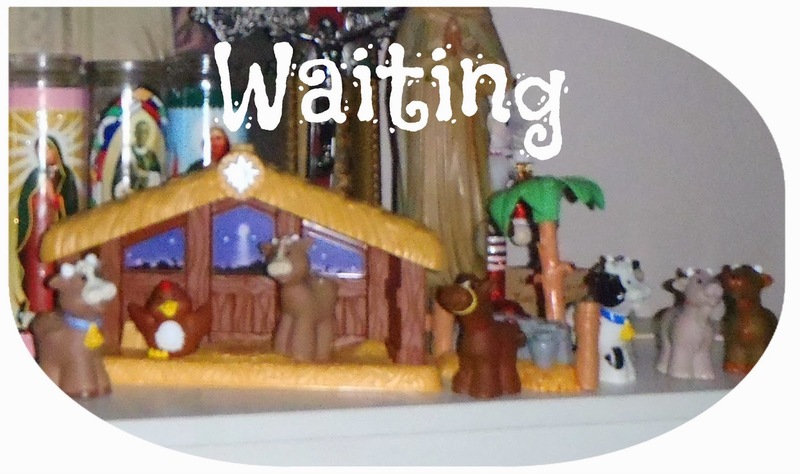 No one has arrived yet (the little Mary and Joseph dolls and their donkey are actually on the top of a window frame in the play room and will be slowly making their way to the stable over the coming days). Earlier this year I began thinking of daily ideas that would be fun for the kids to do each morning when they wake up. 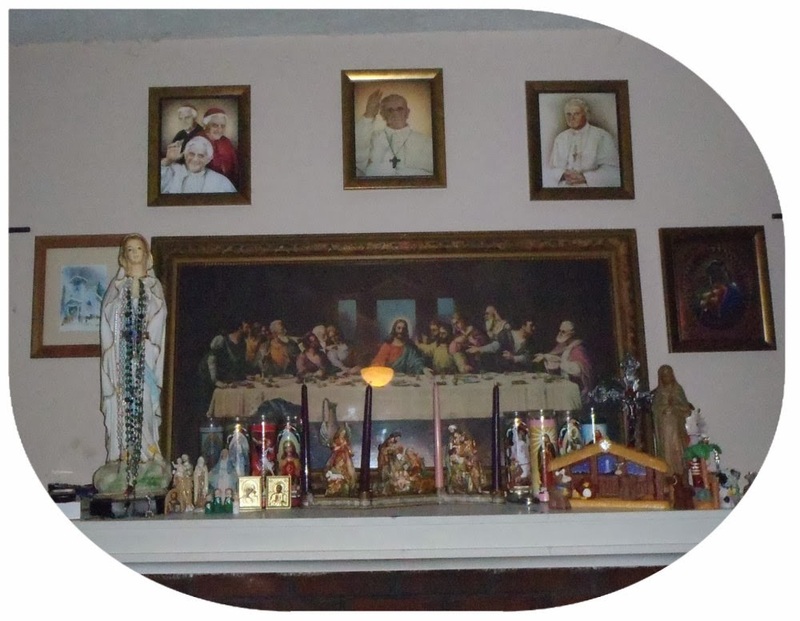 There are some secular traditions that I'm not a fan of (and you don't need to defend any of those traditions or try to convince me of their awesomeness. Me not feeling all warm and fuzzy about them isn't a judgement on anyone else using them. 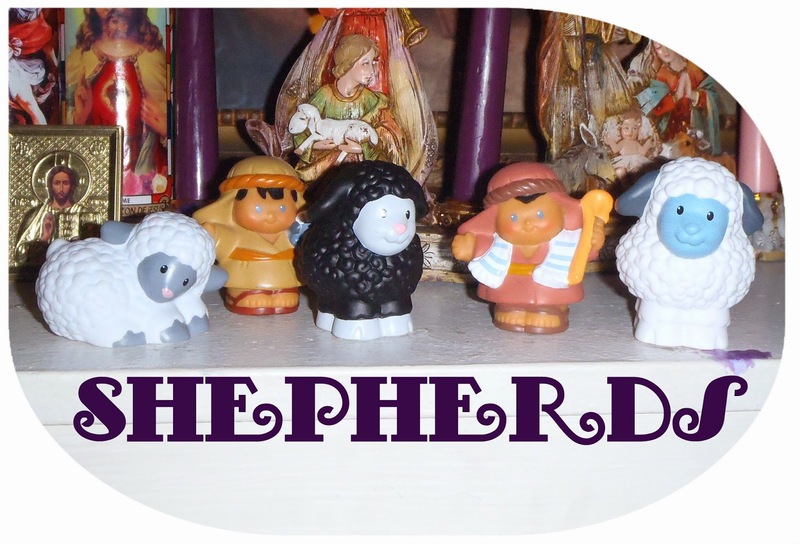 I just don't feel like they fit with our family's celebration of this particular time of year) and I was looking for ideas that would help keep the focus of Christmas on the upcoming birth of our Savior. When I found the Wise Men Adventure's over on Jennifer's Catholic Inspired I knew that I'd arrived at the right place. 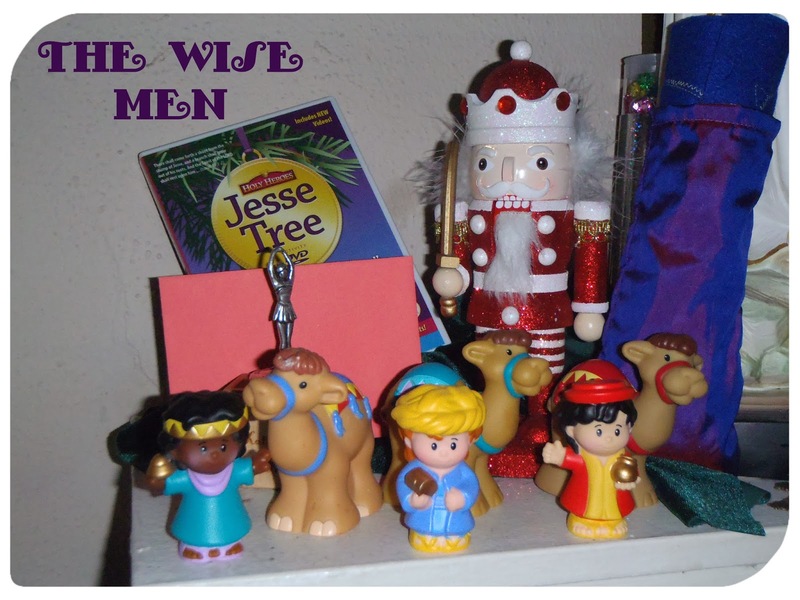 Last night our Wise Men began their big journey. The Shepherds are also out there searching for the soon to be born King. Yesterday Sadie and I spent a lot of time talking about who would find him first. She's cheering for the Wise Men (and is totally ignoring hints from Mom that they might be wandering around our house until Epiphany!). 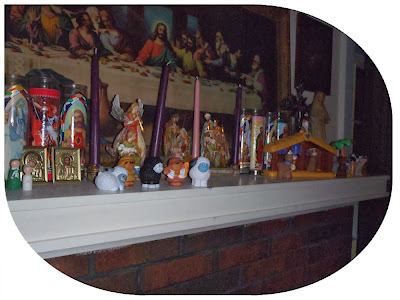 Everyone started out on the altar last night, so that it would be easy for the little one's to find them while I explained what we were doing. After tonight they'll be spreading out in their little groups and having adventures all over the house! 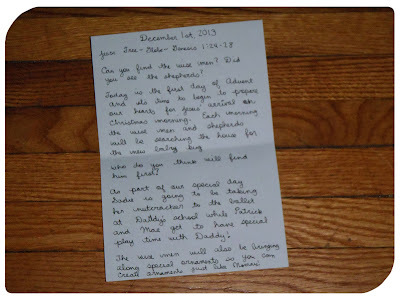 It explained that the search was on and that there would be an ornament and a note each day, along with coloring pages to find with the Wise Men (because I loved how Melody is using the Wise Men to organize Advent and I totally wanted to copy her idea to help me organize over here!). Today's note had the reading for the day that went with the Jesse Tree ornament (I sewed a little purple silk bag last night out of some scraps of fabric to put the ornament in) and it explained that we're preparing our hearts for the birth of baby Jesus now that Advent has arrived. It also explained that most days there will be coloring pages and activities for us to do (courtesy of Holy Heros Advent Adventures!). It also told Sadie that Daddy had gotten her and Mommy tickets to go to the nutcracker at his school today, which is why the little red nutcracker I found at Joann's on super sale is joining the Wise Men this morning and it told Maggie and Patrick that they'd be getting to have special play time with Daddy while we were out of the house. So those are how my plans have unfolded so far!